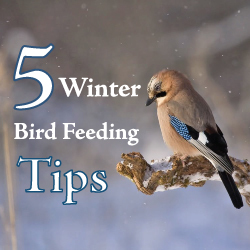 5 Winter Bird Feeding Tips! Winter is a hard time for birds in North America. The almost unlimited access to water as well as fresh vegetation and insects disappears as mother nature shifts herself into a colder, more limited climate. Birds have to work especially hard to find the food and water they need to survive, and so having a bird feeder at your home is beneficial both to the birds and to you! Below are some of our top tips and tricks for Winter bird feeding that are to assure you of a successful feeding season! Keeping your bird feeder clean is a necessary step in top-notch and effective bird feeding! Make sure to clean your feeder regularly, we recommend once a month, and use a diluted solution to get the most out of keeping your Winter visitors both full and healthy! The Cornell Lab of Ornithology takes note on the importance of keeping your feeder clean, "Clean the ground below your feeders, too, to prevent a build-up of hulls, uneaten seeds, and other waste. Moldy or spoiled food is unhealthy both for birds and for your outside pets. And bird food scattered on the ground can attract unwanted rodents." Rinse your plastic, ceramic, and metal feeder (we recommend Drolls Yankee Flipper Squirrel Proof Bird Feeder) well with soapy water followed up by a nine-to-one bleach solution to rid bacteria. If you have a wood feeder, use a three-to-one vinegar solution. This will help to minimize wood fading. Dry your feeder before rehanging, and make sure to double this process if you suspect any sort of disease to be festering in your feeder! Another necessary step in successful Winter feeding is to avoid overcrowding your feeders. Like too many people going sledding on a snowy hill, overcrowding just slows things down and can lead to disaster! Don’t put your chirping visitors through the hustle and bustle of fighting for food. Place your feeder in a generally disturbance free area, and also an area that is convenient for you to refill regularly. That lone tree branch high up above might look like a great spot, but keep in mind that it isn’t sensible for you! Low hanging branches out of the way of disturbances and smaller trees that can be reached from above are best. Also keep in mind that staying within distance of natural shelters such as trees and shrubs is ideal! It may seem obvious, but keeping your bird seed fresh is yet another important part of Winter feeding. Birds are smart and generally will not eat moldy, bad seeds but it’s up to you to keep your seeds fresh so as to not spread infectious diseases amongst your visitors. If activity dies down, that might be a sign that something has gone wrong with your seeds! When exposed to moisture and extreme temperature changes, bird seed will spoil. Make sure you are properly storing your bird seed in clean containers within a cool, dry location to ensure freshness. If you live somewhere where Winter is generally colder than your other seasons, you might be able to get away with storing your seed outdoors but it is important to make sure that animals cannot get into it. An aluminum garbage can with a pad lock is ideal for outside storage, whereas the options for inside storage may vary. Even in the Winter, birds need unfrozen water as a means of survival. Not only is the water needed to drink, but also to bathe in as clean feathers provide the best insulation. Where there is a dependable source of water, there will be birds - especially in the Winter when access to clean, unfrozen water is limited. Birdbaths are the most opportune way for birds to get water in the Winter. If you have access to a pedestal bath that is great, but any shallow and easy-to-clean bath will do. How simple can it be? Really simple! Use an upside-down garbage can lid or a large frying pan for example. Keep in mind that if there is a risk for cats or other animals on the prowl that frequent your yard, you may want to stick to an above ground bath for the sake of the bird’s safety. When using an actual birdbath, an immersion style heater (we recommend the K&H Bird Bath Ice Eliminator Heater) can also be used to keep water unfrozen longer. Like your birdseed, make sure to keep your water fresh, too! Regularly change out bath water to ensure healthy, clean water for the birds. The last tip we have for you is all about the main source of a bird’s well-being - bird food! Generally speaking, if you’re stuck on which type of seed to go with, the most fool proof type there is for all species is black-oil sunflower. Black-oil sunflower seeds attract the greatest amount of different species due to the meat-to-shell ratio and high nutrient and fat content. They’re easy to crack and overall a great choice for feeding, especially if you are looking to attract some different species that haven’t crossed paths with you before! Most birds will pick through “standard” bird mixes including wheat, oats, and flax, and leave everything but the sunflower seeds, so it’s safe to say they’re a bit of a waste! But that’s not to say that straight seeds are the only way to go when it comes to successful feeding. Making your own mixture at a low-cost is certainly doable and recommended! Our suggestion? Mix one 25 lb. bag of black-oil sunflower seed, one 10 lb. bag of cracked corn, and one 10 lb. bag of white proso millet into a clean container or barrel. Mix it up and you’re ready to feed! As always, just make sure to keep your mixture in a clean, dry area and to swap it out regularly - but you already know that! Not looking to make your own mix this season? Over at the National Wildlife Federation, California naturalist David Lukas makes note that, "Whichever seeds you buy, a growing body of evidence shows that backyard feeding helps wild birds—the animals’ growth rates, survival rates, breeding success and clutch sizes all improve markedly when they have access to feeders." We hope that with the help of these Winter bird feeding tips & tricks that you will have a great season of successful feeding! For more information on all of your Winter home gardening needs, keep an eye out for more of our Great Gardener’s Almanac e-mail series. A Homemade Cough Syrup Remedy to Swear by? Let's see!